The following images are part of some LRGB (Luminance, Red, Green, Blue channels) image acquisition tests that I’ve started a while ago in order to establish a workflow for my future deep-sky images. This is why I’ve only used my very small Refractor, a TS APO 65Q with 420mm focal length, the ASI120MM mono camera and Baader RGB CCD filters for colors and a UV/IR cut Baader filter for the Luminance channel. They were all mounted onto the EQ6 SW equatorial mount with the “standard” three-star alignment procedure. That was one of the reasons why I’ve acquired 20 seconds frames instead of longer exposures (the full “technical” details would also include: Gain setting: 50, Gamma setting: 90. Only one dark frame was acquired during the entire session). 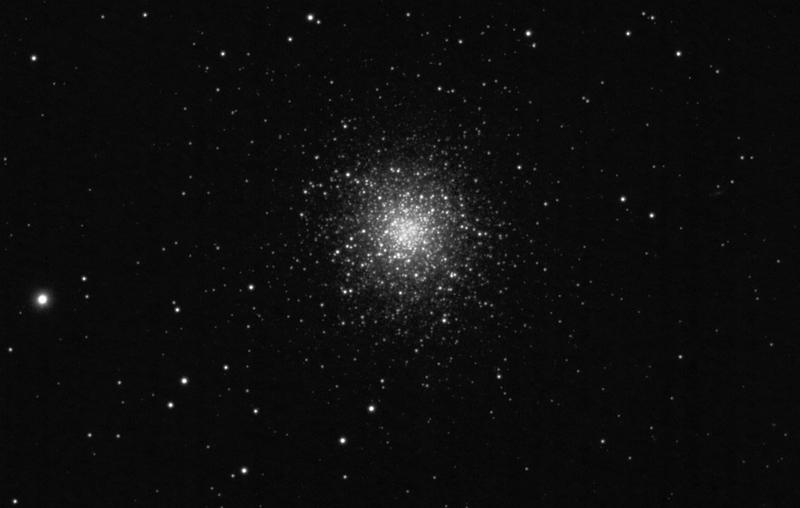 The sky at my location was clear but the limiting visual magnitude next to M 13 was around +5.2, so rather poor conditions for serious astrophotography. The main LRGB image below is made out of 136 frames for the Luminance channel, and 30 frames for each of the color channels. That would put the entire imaging session at 75 minutes, but the “true” exposure time was actually only 45 minutes. That seems to be enough to be able to capture the magnitude +16 (!) galaxy in the right part of the image. For now it seems that the LRGB workflow needs more practicing, but what really surprised me was the amount of detail and limiting magnitude possible with such a small refractor on +5 magnitude skies. I think I will get the small instrument outside again very soon. This is what I’ve finally decided to do on a rather cold September morning (only 6 degrees Celsius at sunrise), to “revisit” the Moon with my C11 SCT. All of the following images were acquired with the C11, a TeleVue 2x Powermate, Baader Red CCD filter and the ASI120MM mono camera. The seeing was variable, with a mean value of around 6/10, with some excellent moments but also with some truly boiling images at times. 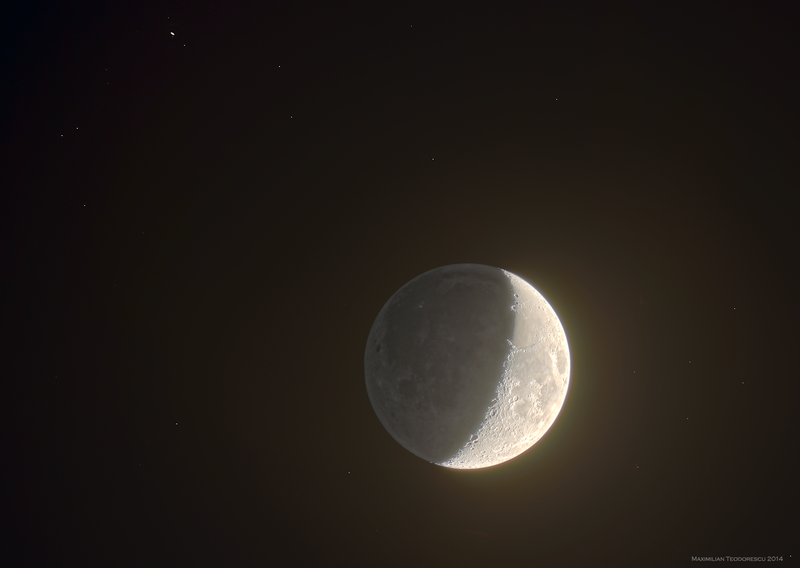 Yet the best thing about this morning was the rather rare aspect (rare for those observers who don’t get up very early in the morning, including myself) of Sinus Iridum. The following image, which for the purpose of enhancing it’s subject I will entitle it “the T-Rex smile”, is a mosaic of four images, each a 900 frames stack. 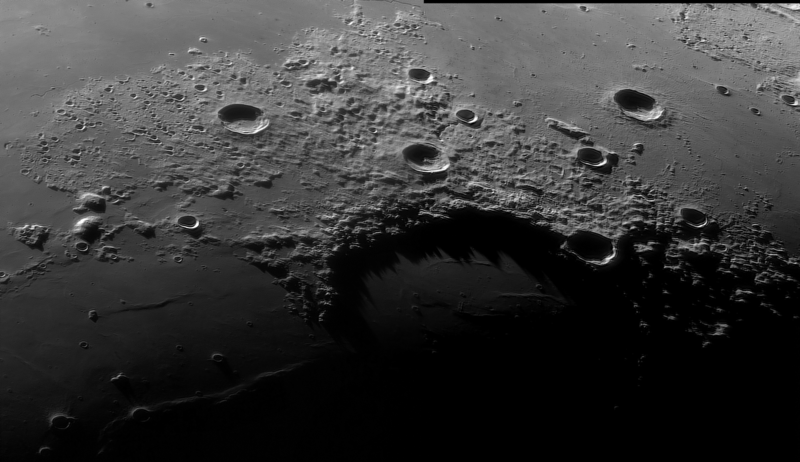 The image shows some interesting details on the floor of Sinus Iridum, including a ridge and something that looks like a rima. 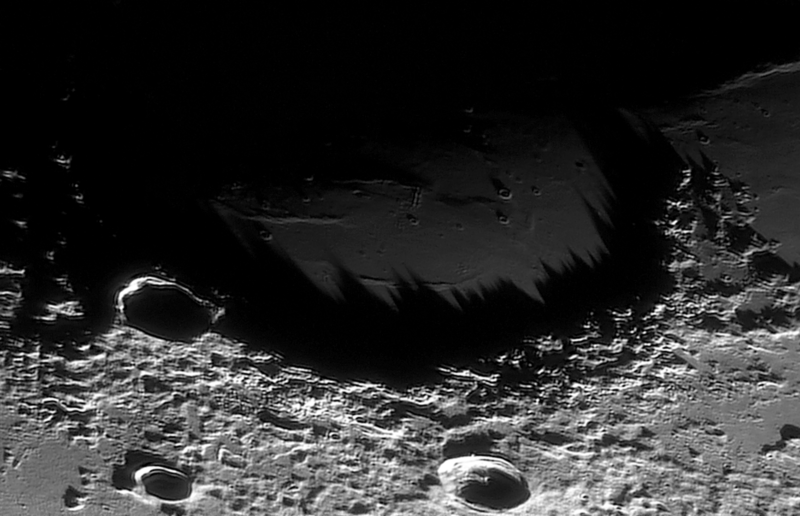 Speaking about rimae, there is one crossing the upper part of the image, being one of the longest on the Moon actually, but not so obvious in my image: Rima Sharp. There are also some abrupt variations of the relief surrounding Sinus Iridum, from the smooth mare lavas to the apparently abrupt edges of this large lunar feature. The most striking details are in my opinion the knives-tips shadows inside Iridum, they surely give a 3d effect to the entire scene. This second image was selected as the LPOD for September 22, 2014. 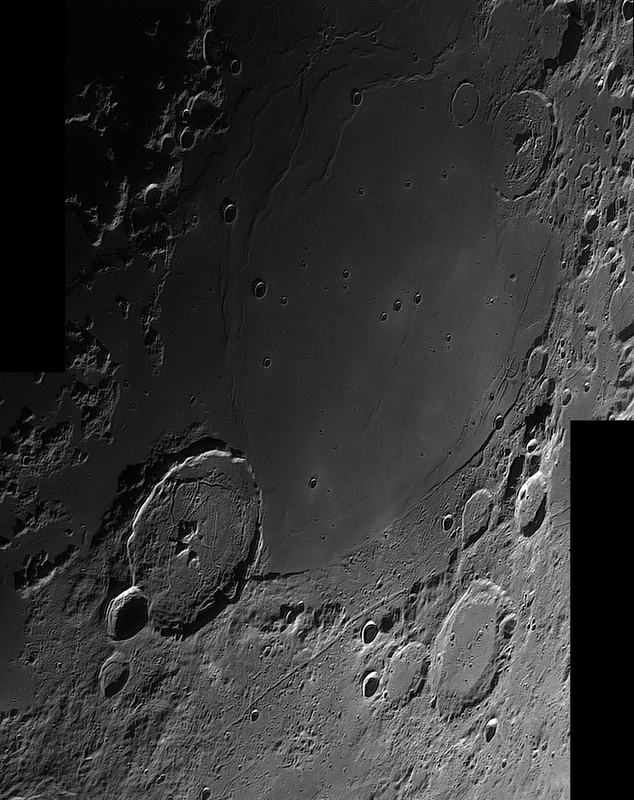 And another region that I like a lot, being one full of rimae and interesting craters, including one of the most remarkable large craters with it’s floor full of rimae: Gassendi. 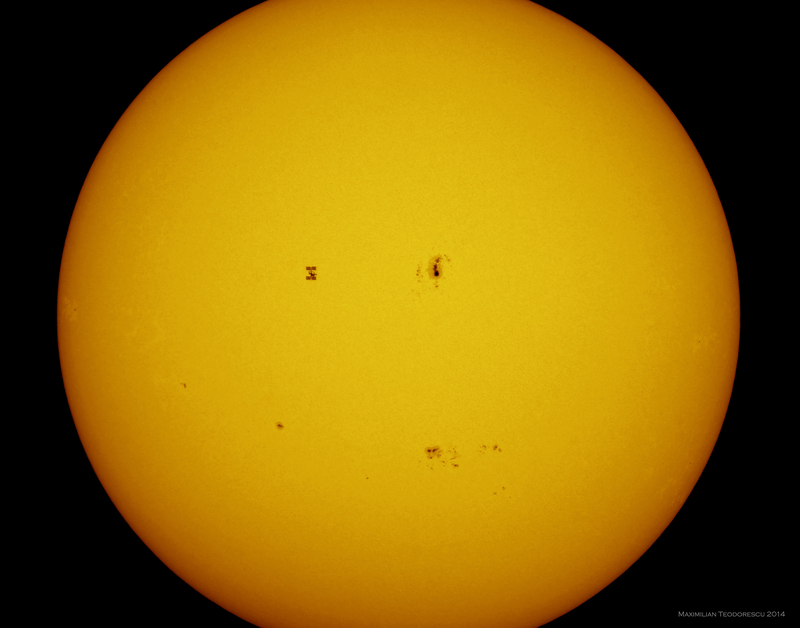 The image is a two-frame mosaic, each a stack of 2000 frames in 5-6/10 seeing. Yet another transit of the International Space Station occurred close to my home on September 11. This time the angular size of the ISS was around 51 arc seconds which is still enough to catch some of the main details of it’s structure. 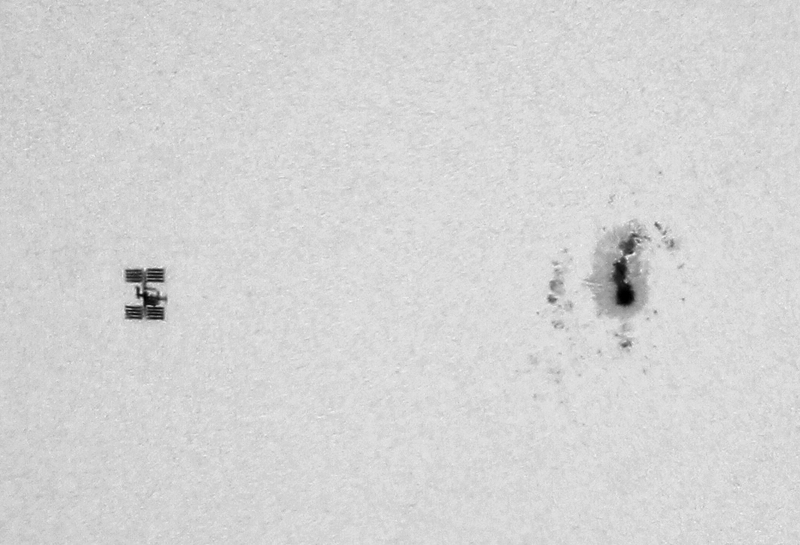 The apparent close proximity of the ISS to sunspot group 2158 also had it’s advantages, in term of size difference: the main sunspot of that group is around four times larger than our planet, but the ISS itself is about 120 000 times smaller than the Earth. So the two main “spots” have a true size difference of around 500 000 times, despite their similar size in the images below. Using the prediction from CalSky, I was able to catch the ISS in two frames using the following equipment: TS APO 115mm F/8 Refractor with full aperture Astrosolar filter, TeleVue 2x Powermate, Canon 550D at ISO100 and 1/3200s exposure. Lots of activity in the Sun these days! 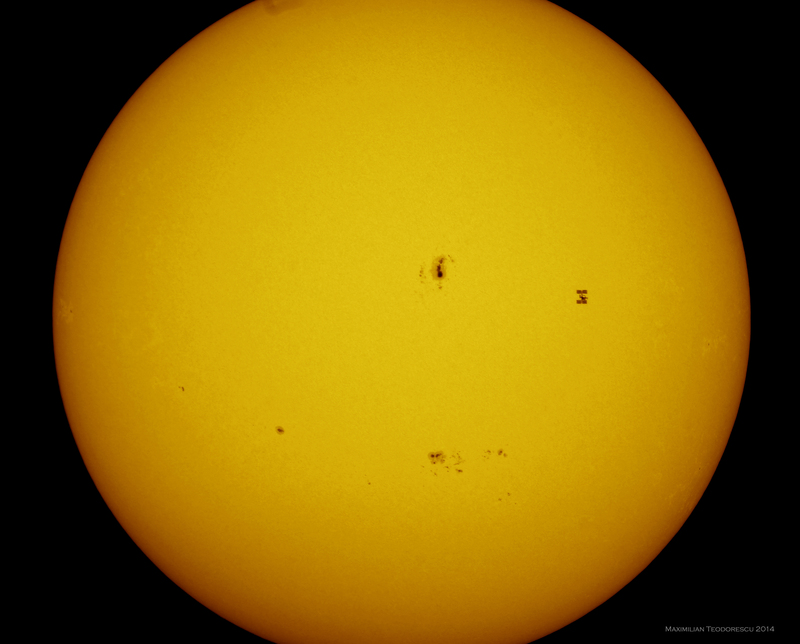 The last image above was featured on the first page of SpaceWeather on September 12, 2014. It’s been a while since my last post, and this was due to a lot of field trips in search of animals and insects. This was the main reason, along with some not so clear skies that didn’t allow me to make any type of Astrophotography. But finally, after weeks and weeks of waiting, I’ve succeeded in taking a few images of my long-time friend in the sky: the Moon. In a very short trip in the village of Dumitrana (Ilfov) together with my brother-in-law, Mihai, and with my re-acquired small TS APO 65Q refractor (after I’ve sold it to another amateur astronomer at the beginning of this year and re-buy it from him), I had the chance to capture a series of images of the Moon at dusk accompanied by Saturn. The series themselves were acquired in order to create a High Dynamic Range image of the pair, showing both the Sun-illuminated part and the Earthshine of our satellite, but also the star-filled background and Saturn with some of it’s satellites, including Titan. The final image is composed of 11 series each a 20 frame stack with exposure times ranging from 1/250s to 6 seconds. The image shows both the Moon and Saturn (upper left) with some of it’s satellites. 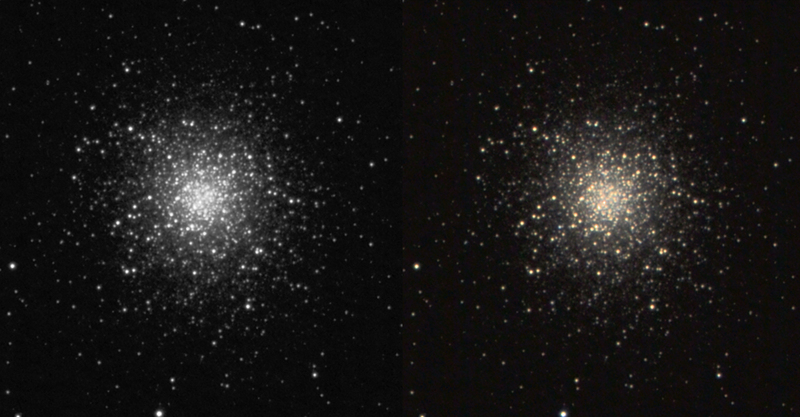 The second image was acquired with one more optical component placed between the camera and the scope: a TeleVue 2x Powermate, increasing the focal length to around 800mm. 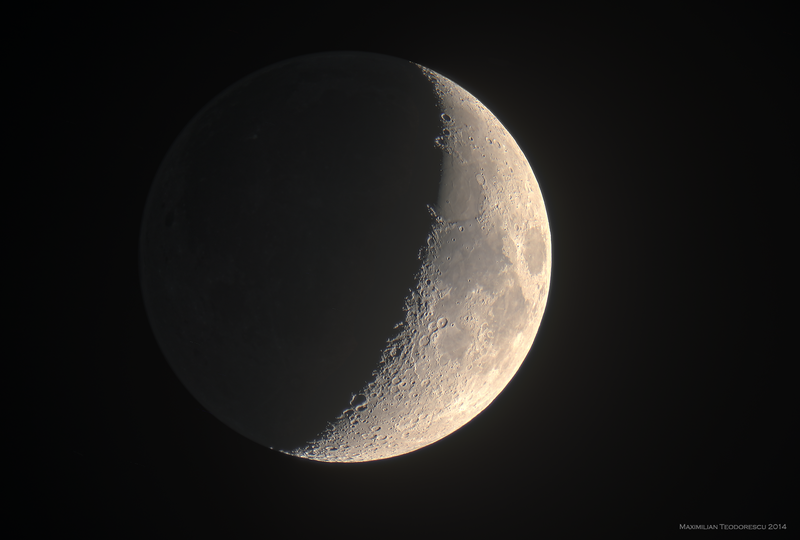 This image presents a view of the Moon similar to what we were looking at through the refractor at 100x. It’s also a multi-image composition, 9 series each 20 frames being merged to form a HDR shot. Hopefully I will get more and better views of celestial objects in the very near future, since I really miss the dark hours of lunar and planetary observing/imaging sessions and I’m looking forward to get my bigger scopes out in the field.